Although all major league baseball players are undeniably talented, some seem to have a more difficult time performing under pressure. One reason for this is the yips, an anxiety based issue affecting mainly pitchers. The issue manifests itself when these pitchers or infielders attempt to pick off runners by throwing the ball to the first baseman and end up throwing the ball wildly in the wrong direction, completely missing the target. Throughout the history of the game, certain players have suffered worse cases of the yips than others. For these players the yips drastically impacted their career, causing early retirement or position changes. Although the yips are a treatable anxiety-driven issue, they can be difficult to overcome without the right mental training for yips. Long before the yips were widely talked about in sports, Steve Blass suffered a career ending case. In 1971, Blass led the Pittsburgh Pirates to a World Series victory. The following season, he played on the National league All Star Team. The next year, his career was ended due to the yips. After tripling his ERA and dropping to the minors in an attempt to redeem himself, he found he could not overcome the issue. His career was over. After an excellent rookie season, St. Louis Cardinal Rick Ankiel fell victim to the yips in his first and only game of the National League Division Series. In merely four innings, Ankiel threw nine wild pitches and walked 11 batters, breaking a record that had remained constant since 1890. After attempting unsuccessfully to save his pitching career, Ankiel resolved to finish as an outfielder. Although this issue can be difficult to overcome, athletes who use sports psychology to improve their mindset and restore confidence have a better chance of overcoming the issue. Mets catcher Mickey Sasser developed the yips in 1989, only two years into his professional career. After leaving the MLB, Sasser started working with a sports psychologist to cure his yips. Using the methods he had learned, Sasser went on to coach college baseball, using proven mental training to help players overcome the same condition he had faced in his career. Even though it can seem like a difficult issue to tackle, the yips are definitely beatable with the right training. Realize that you are the only one you can control the yips. The yips are an anxiety driven issue and the only way to break them is to improve your mindset. 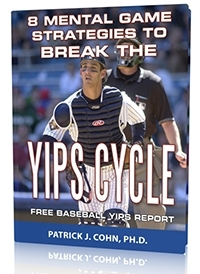 The yips are not a disease. 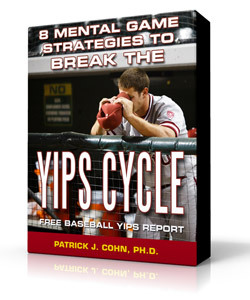 Believing that you can overcome the yips will help you confront the mental game challenges. 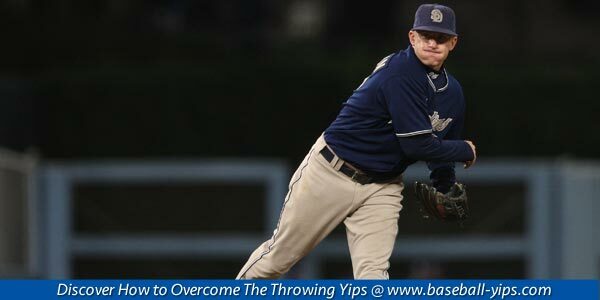 Download Our FREE Baseball Throwing Yips Report Now! 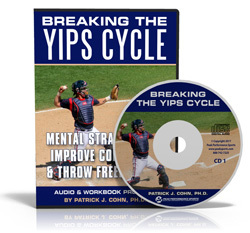 Beat The Throwing Yips With Expert Mental Game Coach – Dr. Patrick Cohn!